When it comes to Philadelphia's lucrative judicial campaign consulting industry, you could say there's a new sheriff in town. Sheriff Jewell Williams made about $34,000 last year advising three judicial campaigns through a consulting firm he founded in late 2016, according to corporate and campaign records. As sheriff, Williams, 60, makes an annual taxpayer-funded salary of $129,760. First elected to the position in 2011, he is serving his second four-year term. Williams is also one of the city's 69 Democratic ward leaders, whose support is considered crucial in winning low-turnout elections among candidates with typically low name recognition. Two of the three candidates he advised won in a field of 27 hopefuls. Some consultants make six figures from obscure judicial campaigns alone. For example, Square Group Inc., a firm run by consultant Charles Finney, made about $225,000 last year advising 17 judicial candidates, campaign records show. Nine of them lost, six were elected, another won a primary but lost in the general election, and another withdrew early. Other veteran consultants include Michael "Ozzie" Myers, a former congressman who was convicted of bribery in the Abscam scandal, and John Sabatina Sr., a Democratic ward leader. There were so many consultants last year, Sabatina quipped, "I thought about forming a union." There's no evidence that Williams did anything improper, and elected officials often work side jobs. But it's unusual for an elected official and law enforcement officer to also work as a paid political consultant. Given the work the sheriff's office does to protect judges and service the courts, the dynamic could create at least the perception of a conflict, experts said. "Jewell is a genuine expert in Philadelphia politics," said Judge Mark B. Cohen, who hired Williams last year to advise his campaign for a seat on Philadelphia's Court of Common Pleas. "That's what he was paid for." Cohen, 68, a Democrat from Northeast Philly, is a political force in his own right, having served in the state House for more than 40 years until losing the Democratic primary in 2016. His father was a city councilman and his younger brother, Denis, is also a Common Pleas Court judge. Former state Rep. Mark B. Cohen, pictured here in 2009 in Harrisburg, paid the sheriff nearly $21,000 in consulting fees during his successful campaign last year for Philadelphia’s Court of Common Pleas. Cohen, who served with Williams in the legislature, said the sheriff helped him reach out to a variety of people, ranging from sales workers in media companies to ward leaders, other candidates for public office, and neighborhood political organizations. Cohen said Williams also produced literature promoting his candidacy. "He had credibility with a lot of the people," Cohen said in an interview. "Some of the people, I reached out to on my own. But he mapped out the general strategy." From March through the May 2017 primary, Cohen paid Williams' firm $20,940 for "consultation" and "advertising," campaign records show. Williams founded the firm, the New Working Group LLC, in December 2016, according to corporate records filed with Pennsylvania's secretary of state. The business is registered to his home address. During the primary campaign, Cohen also contributed $7,750 to the 16th Democratic Ward Executive Committee in North Philadelphia, which Williams leads. Political insiders refer to such payments as "street money," which ward leaders use to hire workers to get out the vote on Election Day. Cohen finished eighth with 4.41 percent of the vote in the 27-candidate Democratic primary for the Court of Common Pleas; the top nine won the party's nomination for the general election. He finished 2,237 votes ahead of the top losing candidate; a total of 827,570 votes were cast. Cohen placed first in Williams' ward with 325 votes, a share of 7.2 percent. He was elected to a 10-year term and earns an annual salary of $180,299. Cohen's victory was all the more impressive because he wasn't endorsed by the Democratic City Committee, which produces its own sample ballots that get distributed to voters. Endorsed candidates must pay the party $35,000 for Election Day expenses. U.S. Rep. Bob Brady, longtime chairman of the Democratic City Committee, has for years warned ward leaders to support the party's endorsed candidate. But there's additional money to be made off candidates who don't earn the party's endorsement, and some ward leaders freelance. Told about Williams' consulting for Cohen, Brady reiterated his disapproval. "[If] they do it, they do it," he said of ward leaders helping non-endorsed candidates. "I frown upon it." The sheriff was also paid $8,000 by Judge Vincent Furlong, a Republican who was appointed by Gov. Wolf to the Court of Common Pleas in 2016 and was elected to a 10-year term in November. Furlong, who ran in both primaries, paid tens of thousands of dollars in consulting fees to other firms and ward committees, records show. George R. Twardy Jr., a Democrat who was endorsed by his party for Municipal Court, paid $5,000 for Williams' services. Twardy, who also shelled out $40,000 to Sabatina's firm, lost in the Democratic primary with 15.3 percent of the vote. Twardy didn't respond to requests for comment, and messages left in Furlong's chambers weren't returned. Overall, Williams' consulting firm in just three months last year took in $33,940 — nearly 1.5 times what about half the people in his neighborhood make in a full year. According to census estimates, the median annual income in his home zip code is $22,316. Cohen and said he believed Williams had previously worked as a consultant, but the sheriff's name didn't turn up on other public records. In Philadelphia, elected officials are permitted to earn outside income; they just have to report sources of $500 or more in income. Because Williams was paid for consulting work only last year, he won't have to report that income until he files his next financial disclosure form, which is due in May. Consultants can provide valuable services to judicial candidates, many of whom are political novices, said Sam Stretton, a West Chester-based election law expert who has represented ward leaders and elected officials. The advisers make sure the candidates get to ward meetings, generate support among their contacts, and make sure the proper campaign literature is handed out. But Stretton said Williams' side job was concerning because the sheriff's office works extensively with the courts. "It doesn't appear to be prohibited. It appears to be allowed by the First Amendment," he said. But "it would probably be better if an elected official did not run the campaigns or consult on the campaigns of people he would be working with in his governmental position." One potential problem: If a judge owed money to the sheriff's consulting firm, the sheriff could punish him by refusing to staff his courtroom with deputies, Stretton said. The working relationship raises issues of favoritism and discrimination in the workplace, he said, "and it just doesn't look right." Williams has also battled claims of sexual harassment, which he has denied. 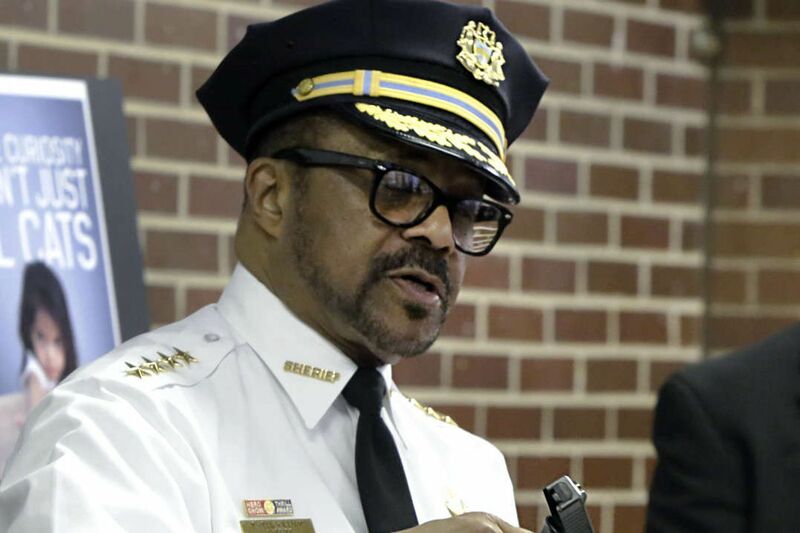 David Thornburgh, president of the watchdog group Committee of Seventy, has advocated for abolishing the sheriff's office and transferring its responsibilities to the Police Department and other city agencies. "If the office of sheriff needs to exist," he said, "there should be plenty to do within that office without having to moonlight as a part-time political consultant." Cohen said Williams "did not use the powers of sheriff in any way."